Dell PowerVault MD3620f 24x SAS Bay Rackmount Fibre Channel FC Storage Array. In Good Condition, Full Working Order. 1x Dell PowerVault MD3620f Rackmount Fibre Channel FC Storage Array. 2 x 8Gbps Fibre Channel Redundant Controllers 8GB Cache. 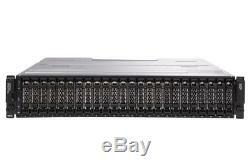 24 way backplane for up to 24 x 2.5 SAS or SAS SSD hard drives. The Dell PowerVault MD3620f array is the introduction of 8Gb/s Fibre Channel in the MD series of arrays. The SAN solution is ideal for entry-level storage consolidation that require high availability, high performance and business continuity without sacrificing ease of use and reliability. Designed for flexibility, the MD3620f arrays support a range of drive types, enclosures, and RAID levels all within a single array. Meet escalating performance demands for Fibre Channel storage consolidations that require high availability and high performance without sacrificing ease of use. The PowerVault MD3620f series features include 8 Gbps throughput, up to 64 Hosts, 2GB cache per controller, single or dual controllers, and capacity expansions up to 192 drives. Enhance throughput with four 8 Gbps ports per controller for your data intensive applications all the while providing business continuity. Implement tiered-storage solutions by mixing serial attached SCSI (SAS), near-line SAS and solid-state drives (SSDs) to optimize your storage area network (SAN) to cost effectively meet all application requirements. Scale up as you grow , supporting a base of 120 hard drives, with an optional upgrade up to 192 hard drives. Forge ahead with PowerVault MD3620f. Help improve or protect your data center scalability, storage utilization efficiency, infrastructure cost and deployment versatility. With high-speed Fibre Channel, the MD3620f provides multigenerational/multiprotocol single management interface and support. Put more storage resources to work for you with reliability on top of mind. Store, move and use your data faster, easily and more efficiently with PowerVault MD3620f arrays. Twenty-four 2.5 drives in a 2U enclosure. Scales up to 192 hard drives storage capacity with PowerVault MD1200 and/or MD1220 enclosures, enabling a customizable and expandable tiered-data environment with mixed drive types. Available in single- or dual-controller models. With task-based tools and automated wizard in the resource DVD, setup and management is easier and faster for storage consolidation and flexible, shared networked storage. The PowerVault VMware vCenter Plug-In 5.0 support provides VMware administrators with powerful capabilities designed to increase their productivity and simplify their jobs. The Plug-In is designed to monitor and manage the MD arrays used in conjunction with VMware virtualization software, allowing administrators to monitor and provision the storage subsystems they employ with the ultimate goal of ensuring the performance and availability of the virtual infrastructure they are managing. MD storage systems are certified for use in virtualized application environments with VMware ESX, Citrix XenServer and Microsoft Hyper-V software. Please see hardware support matrix for more details. In addition, the MD series storage arrays support vSphere Storage APIs for Storage Awareness (VASA). This enables unprecedented coordination between vSphere/vCenter and storage arrays. It provides built-in storage insight in vCenter to support intelligent VM storage provisioning, bolster storage troubleshooting and enable new DRS-related use cases for storage. MD series Fibre Channel arrays also offer a Storage Recover Adapter (SRA). A SRA allows VMware vCenter Site Recovery Manager (SRM) to integrate with third-party storage array technology providing additional business continuity. Keep step with the future. Performance improvements over previous-generation MD arrays include. Upgrade cache from 512MB to 2GB battery-backed cache per controller. Replacing SATA drives with near-line serial attached SCSI (NL-SAS) drives for higher capacity and increased performance. Adding SSD support to meet the demanding performance and reliability needs of data centers and other high-performance computing environments. Offering improved scalability with support for supplementary expansion with PowerVault MD1200 and MD1220 enclosures up to 192 drives total. Four times the base capacity over the previous generation. Six times the capacity over the previous generation. In addition, the high-performance tier option provides an incremental boost to performance, ideal for sequential applications, such as Web streaming or data backup. The item "Dell PowerVault MD3620f 24x SAS Bay Rackmount Fibre Channel FC Storage Array" is in sale since Saturday, July 28, 2018. This item is in the category "Computers/Tablets & Networking\Enterprise Networking, Servers\Network Storage Disk Arrays\NAS Disk Arrays".